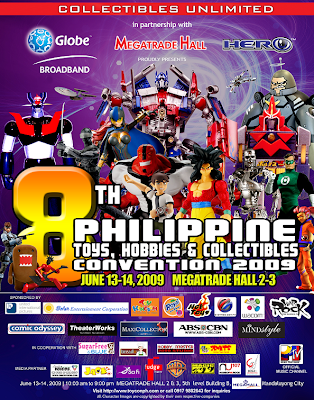 The 8th Philippine Toys, Hobbies and Collectibles ConventionJune 13-14, 2009Megatrade Hall 2-3 and Conference Center A and BSM Megamall, 5th Level Bldg. B 10am-9pm www.toyconph. com. Look for me. Will be joining a booth there with Ariel Atienza, Lyndon Gregorio and Andrew Villar. See yah!